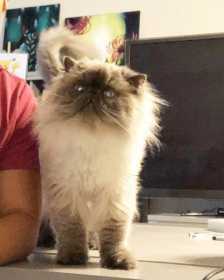 MISSING CAT: Long haired blue-point himalayan male cat with a white body, grey face, feet & tail. He is 4 years old. His name is "Austin". He was last seen in the Scottsdale Crossing subdivision off 183A and Scottsdale Drive (across Blockhouse). Please let me know if you've found him call or text (325)320-4283.